This week we had the great pleasure of welcoming son Ryan and father Dave to the venue. They first fished the lake nine years ago, shortly before we bought the place. The venue has changed a lot since then and we really hoped they liked what we’ve done! They had decided that they wouldn’t do the nights which can be a risky choice but rest and comfort were more important than the number of fish on the bank. The lake today is very different from their last visit and they had done their home work. They’d followed our advice to the letter with regards to materials and setup and were ready for the challenge. On Monday, Ryan told me that he had hooked an unstoppable beast from point ‘A’ that headed straight for the bridge and that was about it…. welcome back to Beausoleil! A quick tour in the rowing boat revealed how challenging the lake bed is and how pinpoint accuracy is the key to success. The margins and open water are littered with jagged rocks and for anglers who don’t spend a lot of time on the bank, they were going to have to learn very fast! After I left, they dropped their rigs and later that day Ryan was first in with a good catfish of 72lbs. That’s a big fish but compared to the stock we have, well below average size! With the prep work done, the runs came like clockwork. Every afternoon/evening they banked two to three good fish between them. They used the rowing boat very time which was hard graft but it kept the runs coming. In hindsight they said they regretted not hiring the bait boat which makes things a lot easier! When they’d had enough, they wound in and retired to the lodge for a well earned kip. They made it look simple and easy (which it isn’t) so hats off to them. They don’t even consider themselves to be serious carp anglers. Well they had me fooled cause they were doing it exactly right! Like me, Dave is a machine tool engineer and this gave him a big advantage when it comes to hook sharpening! If you’re not hook sharpening every reset or at least changing hooks, then your week will be hard. 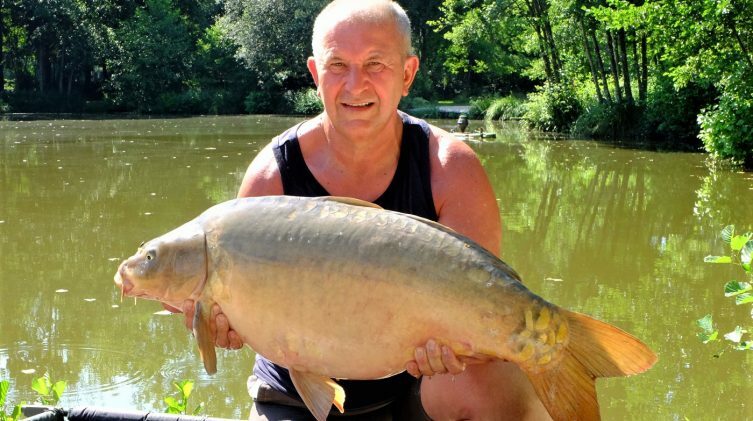 Sure it’s fun to catch fish with your own baits and rigs but it’s very important to get off on the right foot here and for more and more anglers, gambling with their much longed for carp fishing holiday is not worth the risk. Ryan and Dave went with our rigs and baits and it was a decision they did not regret for one second! After consistent success during the week and with confidence in their skills growing, they saved the best two fish till the last afternoon. Both fell to Dave’s rods and came in at 34lbs and 35lbs. Dave’s more at home by the river, being mobile and targeting smaller species. He wasn’t sure this type of fishing was really for him. After a week of chasing these “crafty buggers”, he’d changed his mind, he loved it! 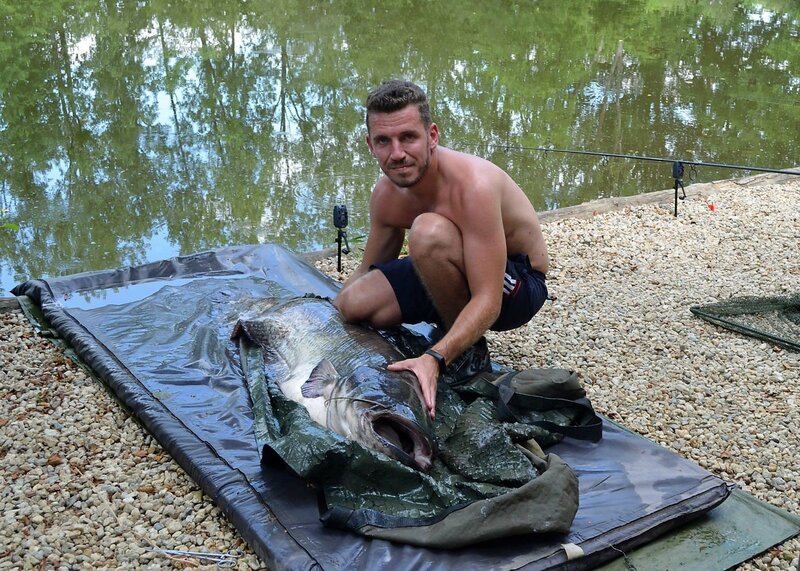 Ryan also snuck a last carp on Friday afternoon that made the 30lb mark. I know the guys had a bit of shock at the start of the week when the reality set in of how much the venue has changed. 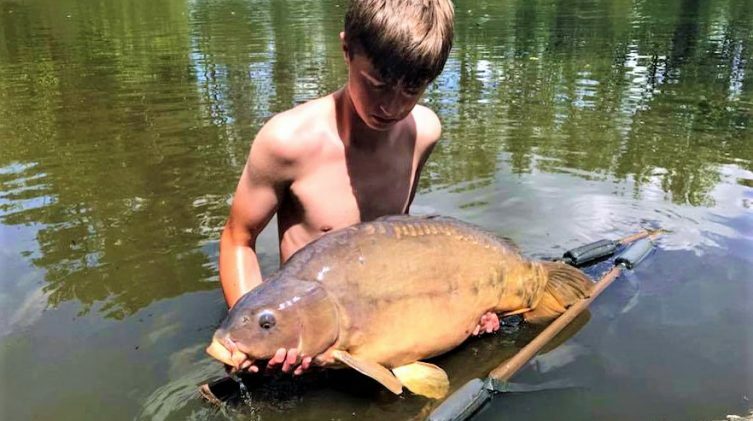 Ten years ago, it was a runs water and the best carp you were likely to catch was 25lbs, but the Beausoleil of today was exactly what they wanted, and they were delighted with the new average stamp of carp. Dave was particularly impressed by a common he caught. Weight wise it was nothing to shout about but it was an absolute mint bar of gold and he really appreciated the quality of it describing it as a proper carp! Well done guys, you played it just right! It’s the end of July during a very prolonged heat wave with temps up to 35 degrees… i.e. damn hot! The lake is like bath water at 25 degrees but the new aeration system is still holding 70% dissolved oxygen as a minimum which is excellent! The fish are actually feeding like crazy right now with massive sheets of old feeding bubbles evident on the surface every morning. Despite the heat, the fishing has been very consistent. Listen to Matt’s advice. Thanks for an amazing week of fishing, we’ve both really enjoyed it.